We hope you have been enjoying the pawsome weather! Even though you may be out having fun in the sun sipping lots of meowjitos and pina-cat-ladas! But we must remember how our kitties feel in these hot temperatures! So here at Pause, our kitties have provided some top tips to keep your furry friends safe and well from the heat, along with the possible symptoms of heat, when to see a vet and what to look out for. We are also giving away a free Catit water fountain to keep your kitties feline cool. Read on to find out more – and click here to take a look at Catit’s a-meow-zing range of cat goodies!! Ensure there is always lots of fresh drinking water available. In general, cats drink a cup of water a day. But it is vital to prevent dehydration and other health problems such as kidney failure. Place a number of water bowls around the house and back gardens so your cats have access to water, changing it frequently to encourage them to drink!-Petrus. Never leave animals unattended in the car in the heat!-Pumpkin! Cats with pale ears and noses like me are prone to getting sun burnt because the fur is thinner on those areas of the body. Popping on sun cream on our ears and noses will help prevent exposing these vulnerable spots as this will reduce the risks of skin damage and cancer!-Michelle! Even though I love to play, it is important to save any physical activity for the cool morning and evening hours. It is also worth keeping us indoors during these times to avoid the sun when the sun rays are strongest. If your kitty insists on going outside, ensure they have plenty of cool spots and shady areas to retreat to around the house and garden-Bear! Opening the windows to let in the breeze and encourage air circulation can help provide a cool area to rest. We will appreciate the breeze blowing so we can keep our fur cool. Try and place protective netting to prevent them from falling from the window which can result in severe injury!-Clifford! Get in to a routine of brushing and combing your cat’s fur to avoid clumps which make us hotter and will protect our delicate skin. Especially if you have long haired kitties like me!-Marijke! Creating cool, dark spots for use to retreat to when they get too hot. Just place a cardboard box in a quiet place and out of the way, such as the closet, behind a chair or near a cool spot in the house. Line the box with a towel or other cool cotton fabric!-Liquorice! Check your cat’s paw pads and toe beans for signs of burns from walking on hot surfaces and can cause discomfort. Even though our paws are quite tough, they’re actually extremely sensitive to the heat and cat burn easily!-Max! Keep us out of conservatories and greenhouses. We’re curious creatures and like to sneak in to new places. These areas can get dangerously hot especially when the weather feels warm and we can accidentally get trapped in to these places!-Noodle! Even though we don’t like to get really wet, you can try this little trick to keep us cool. See if we’ll let you put a damp towel or cloth with cool water and wipe down on our tummies, paw pads, toe beans, armpits, under the chin and on the outside of the ears!-Poppet! Don’t be worried if we aren’t eating as much, this is normal in the heat!-Sweet Cheeks! Make sure that they are comfortable since they are not as mobile to move around as much and can become overheated easily. The best place for elderly cats is indoors where we can stay feline calm. Cool, flat surfaces and soft beds are great choices to maintain our temperature comfort!-Aunty Anne! According to Spring Corner Vets, ‘if your cat is excessively dribbling, panting, or collapsed then these can be signs of heatstroke and you should try and cool your pet down by moving them to a cool space and placing fans or cold towels on them and get them to a vet’. We hope this information will help you take precautions with your own furry felines. For the Bournemouth Branch-01202 555770 . For the Poole Branch-01202 497834. 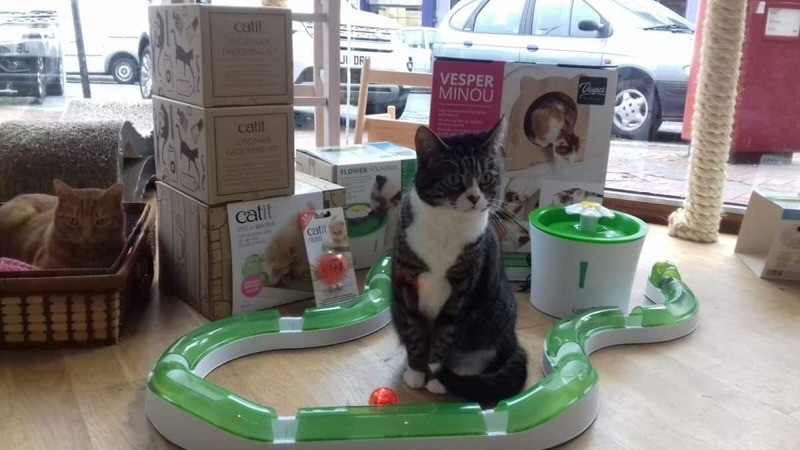 We would like to give a huge thank you to Catit for donating some their goodies for our cats including their grooming products, fun toys and 2 water fountains. We really do appurreciate their kind generosity. 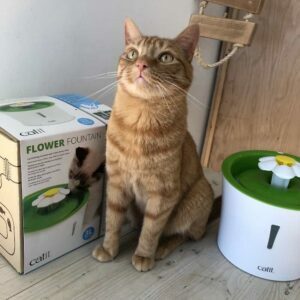 We are also giving away one of these pawsome fountains! For your chance to win, simply comment on our Facebook competition if you have any other tips that help protect your kitties from the heat. Whoever comes up with the best tip will win the water fountain plus free weekday entry. The fountain is collection only so we will get in touch with the winner for more details!